Hamstring muscle injuries, such as a pulled hamstring, occur frequently in athletes. 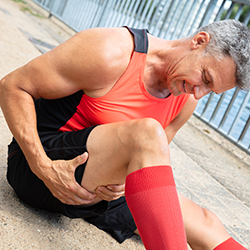 A pulled hamstring or strain is an injury to one or more of the muscles at the back of the thigh. There are three hamstring muscles: semitendinosus, semimembranosus, and biceps femoris. They start at the bottom of the pelvis and cross the knee joint, ending at the lower leg. The muscle fibers join the hamstring tendons near where the tendons attach to bones. The hamstring muscles help to extend the leg straight back and bend the knee. A hamstring strain can be a pull, a partial tear or a complete tear and is graded according to severity. A grade 1 strain is mild and a grade 3 is a complete muscle tear. Muscle overload is the primary cause of hamstring muscle strain. This happens when the muscle is stretched beyond its capacity or challenged with a sudden load. For example, during sprinting, the hamstring muscles are stretched as the back leg is straightened and then loaded with body weight and the force of forward motion as the toes push off. The stretching and loading can result in hamstring muscle strain. Athletes who participate in sports like football, soccer, basketball, running, sprinting, and dancing are at higher risk for muscle strain. Cross train to give hamstrings a break. Increase exercise intensity gradually, 10% per week. If injured, the DOC surgeon or PA will ask about the injury and examine the thigh for tenderness, bruising, pain, weakness, and swelling. Treatment of hamstring strains varies depending on the type of injury and severity. The goal of treatment is to help the guest return to all activities. The DOC treatment plan may include the RICE protocol, immobilization, physical therapy, surgery for a complete tear, and PRP injections. Platelet-rich Plasma (PRP) is currently in use to speed the healing of hamstring muscle injuries. PRP is a preparation developed from a guest’s own blood. It contains a high concentration of proteins called growth factors that help to heal injuries. DOC incorporates PRP injections into the nonsurgical and surgical treatment regimen for some hamstring muscles injuries.